Recently I was given an audio copy of Bravo Two Zero, a military memoir by Andy McNab. 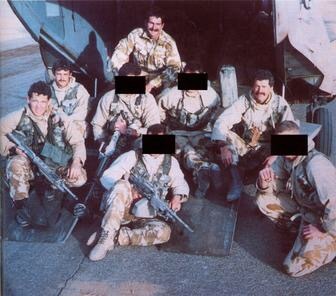 McNab was the sergeant of an eight-member SAS regiment given a mission to Iraq, January 1991. The whole of the game is to get everyone over the border. Vince clearly had an injury. We’d have to do all our planning and considerations around the fact that he was in trouble. None of this, “No, it’s okay, Skipper, I’ll go on.” Because if you try to play the He-Man and don’t inform people of your injuries, you’re endangering the whole patrol. If they’re not aware of your problem, they can’t adjust the plan or cater for future eventualities. If you make sure people know that you’re injured, they can plan around it. We can be part of various teams in life where we get injured do to fierce fighting-on the job, at the family reunion, in the stock market, even at church. And what Sergeant McNab said about Vince in Iraq is true for all the injured people and those on their teams. The injured have to speak up. Otherwise, the whole team is in trouble. And they may be completely unaware unless the injured person speaks up. The team has a responsibility to adjust. The whole of the game is to get everyone to the destination together, to stay unified in fulfilling the mission. If that means slowing down to tweak the plan, then accept and commit to it. For the sake of the team and the mission, take the time to listen and adjust. Playing the He-Man weakens the team. Pulling yourself up by your bootstraps disrespects and distances your team. Are you injured? What is your injury? Which team member needs to know? Be courageous and let the tweaking begin. You’re welcome, Jo. Thanks for the encouragement.